It would take a particularly buoyant mental state to decide that sprinting up the sail of a fast-moving yacht and then jumping off of it for no apparent reason (or even a large wad of cash) is something a person should attempt. 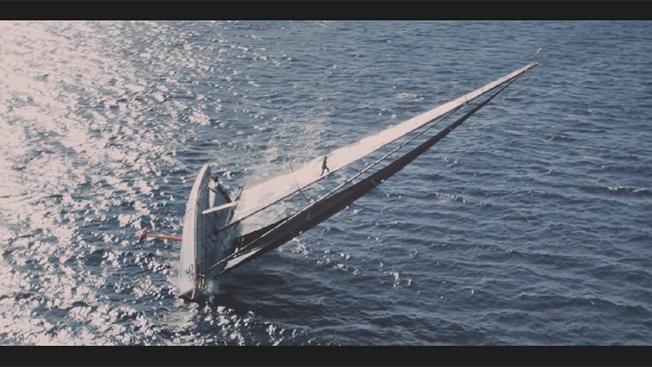 Alex Thompson, perhaps the world's best-known yachtsman/stuntman (and don't we all know so many? ), thought it a good idea to try the bizarre feat of running up the 10-story height of a yacht sail and diving into the ocean. He attempted a similar stunt in 2012, clambering onto the keel of a yacht and accumulating more than 2 million views on YouTube for his trouble. In both cases, nonsailors seem nonplussed by his accomplishments, with video comments like "stupid and not that hard." But yacht enthusiasts are quick to point out the dangers that might not be apparent if you lack the perspective of experience on the water. In case you can't tell, both stunts were sponsored by Hugo Boss. I realize the branding is subtle, so I thought I'd make that clear. While the cut of this guy's jib is still up for debate, the cut of his suit is clearly not.